Pasta is pasta, right? Most boxed, dry pastas are pretty self-explanatory. You boil some water, throw the pasta in until it’s cooked al dente, and then mix with your favorite sauce. 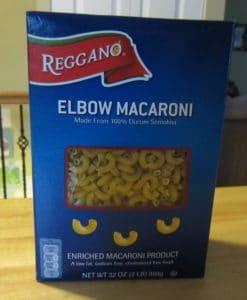 Aldi’s Reggano Elbow Macaroni is no different. What makes this pasta special is the recipe on the back of the box. It makes the BEST homemade baked macaroni and cheese. I frequently make it for my family, and I also take it to friends who have just had babies. The Reggano Elbow Macaroni is made from 100% Durum Semolina and is low fat, sodium free, lactose free, and cholesterol free. It contains no artificial colors, flavors, or preservatives. It comes in a 32-ounce box. One 1/2 cup serving will net you 200 calories (and that’s before any additions like sauce). To prepare the pasta, boil water (4 quarts for 16 ounces of pasta). Add salt to taste. Add pasta; wait for water to return to a boil. Stir frequently. Cook until al dente (firm to the bite), approximately 9-11 minutes. Remove from heat and drain. Serve immediately with your favorite Reggano sauce. Also, 16 ounces of pasta serves 8 people. 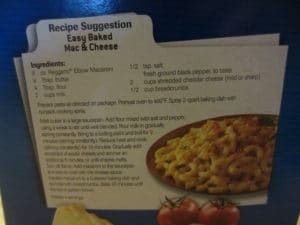 Now, on to the hidden gem recipe on the back of the elbow macaroni box. Prepare pasta as directed on package. Preheat oven to 400 degrees. Spray 2-quart baking dish with nonstick cooking spray. Melt butter in a large saucepan. Add flour mixed with salt and pepper, using a whisk to stir until blended. Pour milk in gradually, stirring constantly. Bring to a boiling point and boil for 2 minutes (stirring constantly). Reduce heat and cook (stirring constantly) for 10 minutes. Gradually add shredded cheddar cheese and simmer an additional 5 minutes, or until cheese melts. Turn off flame. Add macaroni to the saucepan and toss to coat with the cheese sauce. Transfer macaroni to nonstick-sprayed baking dish and sprinkle with breadcrumbs. Bake 20 minutes until top is golden brown. This baked macaroni and cheese recipe is comfort food at its finest. It’s also not terribly complicated. You make a basic roux (a mixture including flour, butter, and milk), add the cheese, add the cooked macaroni, sprinkle on some breadcrumbs, and bake it. It takes longer to make this than it does to make a box of Kraft mac and cheese, but if you have some time, it is worth it. This is a great dish for your family, for a potluck, or for friends recovering from surgery. When I sent it along with a chicken dish to a family that recently had twins, they talked about how great it tasted and were surprised to learn the recipe came off the back of the Aldi pasta box. This mac and cheese is that good. Aldi’s Reggano Elbow Macaroni is your basic boxed pasta. Where it really shines is when you make the Baked Mac & Cheese recipe on the back of the box. It is the ultimate comfort food. Highly recommended.